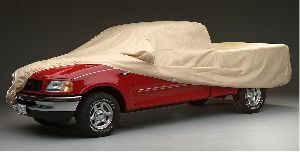 Showing 1 - 10 of 47 Products for Car Cover. 380 Series fabric is Kimberly-Clark's newest film barrier fabric, offering great performance at a competitive price. At 3.2 ounces per square yard, it's about half the weight of the popular high-performance NOAH(R) fabric. The three-layer construction uses inner and outer layers of spunbond, sandwiching a middle layer protective film barrier. The film barrier has microscopic holes, smaller than droplets of water (and most dust particles) to stop moisture, but still allow any moisture vapor or heat to easily escape from under the cover.